Spray paint projects are quick and fun. When the weather is nice I grab a few items, set them up outside and start painting. I was trying to stage photos for the Radiant Orchid Chest of Drawers a couple of weeks ago and couldn’t find a darn thing that worked! The Radiant Orchid is a beautiful rich color and I spray painted the hardware white for a bold contrast. So I decided to spray paint a few glass jars in the same white, in hopes that I could use them in the display. I gathered a few mason jars, ball jars, and assorted glass pieces I had in my stash. The white spray paint is the Wal-Mart brand. If I haven’t used a can of spray paint in a few days I set the can upside down for a few minutes then shake it really well before using it. It only took 10 minutes to spray the jars. I added a few branches of small white flowers and …..ta-dah! Approximate cost of the project is $2. I had all the supplies on hand. Such a simple project, yet the white jars and flowers make such an impact. What do you think? 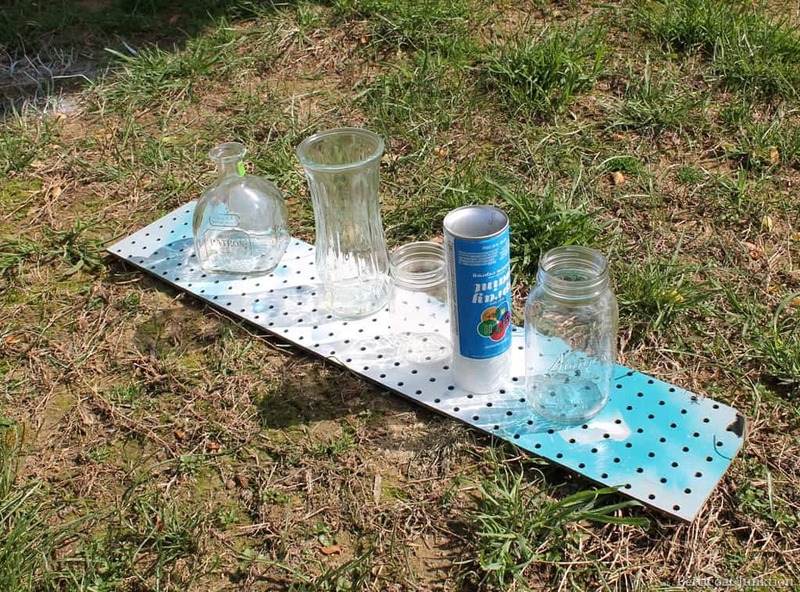 I love recycling and reusing anything – especially plastic! Your yellow water bottle vases look great and make me smile. They are a happy color. 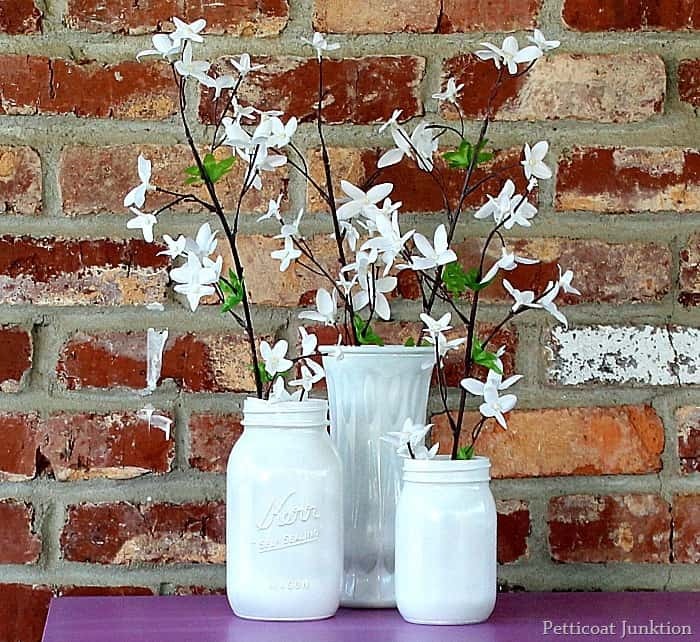 The white jars/vases look wonderful and can be used anywhere. 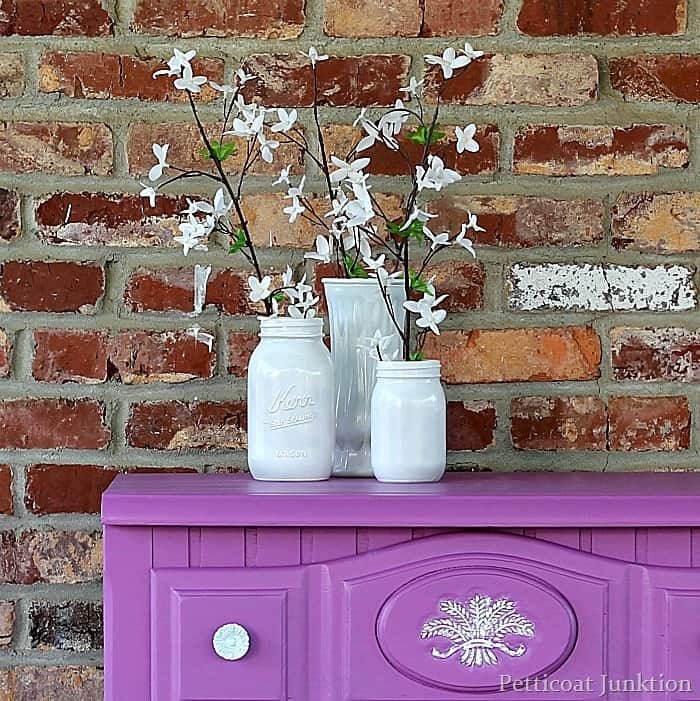 I love your purple buffet/dresser! Gorgeous. I vissit each day a few web sites and information sites to read content, however this website pfovides feature based writing. Love the jars and boy do they look nice on the dresser! 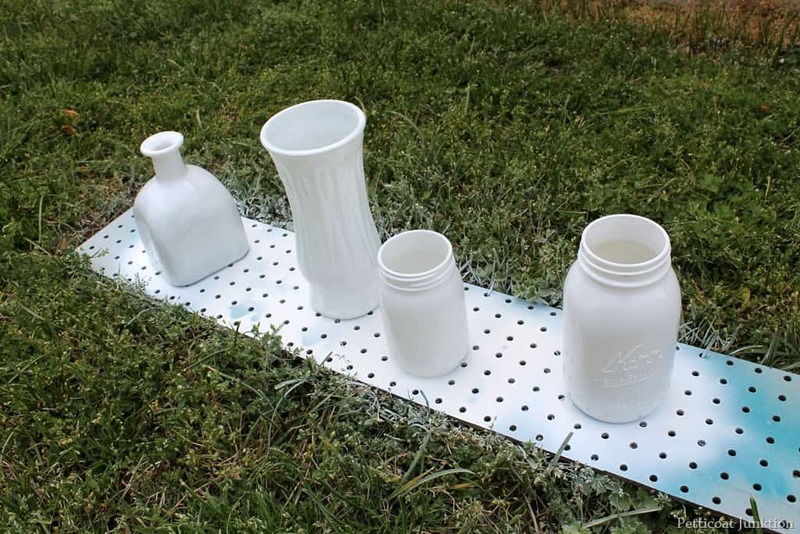 Do you have a tool to use with your cans of spray paint so your finger doesn’t get tired? I thought I saw one in a picture a while back. I do have one Kate, but most of the time I forget about it…then I get paint all over my finger! Teri, probably the outside. But, Kathy, you are inspiration to me. I just read some things that make me upset, so in order to feel normal again, I will have to go spray paint something!!!! Painting is therapy!! Love the jars. I spray painted a couple of vases, one from the florist and one I bought somewhere, they are vastly improved. Got the idea from you! Great Idea and I love your radiant Orchid dresser! Dumb question but did you paint the outside of the jars or the inside? Not a dumb question at all Teri. I meant to include that info when writing the post and forgot. I just sprayed a little white paint onto the inside top of the jars. Thanks for the comment and question.